Home Beers Pyramid Breweries, Inc.
Chai Wheat | Pyramid Breweries, Inc.
Our Chai Wheat is an unfiltered, fusion-inspired brew designed to be a unique alternative to commonplace wheat beers. With essence of Chai tea, noble hops and gracious amounts of sweet caramel malts, the result is a well rounded, sweet, and robust wheat beer, distinctive in its class. Edit: This is a "decent" spiced brew, but I would prefer tea every time over this bottle. Picked up the winter 12-pack tonight at the 16th st. Albertsons for $13... This one is poured into my slim tulip.. hazy orange amber with no real head or retention. Flavor has all the same aromas translated on to the palate with some malty sweetness... Spicy and little promise of anything better. Good body and carbonation for a pretty average beer. Appearance - Pours a cloudy, dirty orange color with a white, finger width head. Sub-par retention. no lace. Smell - Predominant chai notes, clove spice and subtle menthol, fruity esters and backed by a light wheat aroma. Taste - Follows the nose and as expected. Chai tea flavors dominate the flavor profile. Sweetness with a bit of clove spice, fair earthiness, stone fruit and ends with a subtle menthol quality. Any wheat is buried fairly deep. Mouthfeel - Light to medium body with a sharp, lively carbonation. Overall - I believe they achieved what they intended to do, but the end result is something I don't care much for. It's interesting and unique, in the least, but nothing I'd really want to drink again. 12oz bottle poured into a snifter. Enjoy by 011113. A: Pours a hazy golden orange with a 1 finger dense white head. Too cloudy to see any real carbonation. Head fleets to the edges of the glass and leaves no real lacing. S: Pretty spicy characteristic up front from the chai. Backing of wheat and maybe a spiciness from the hop too. Interesting take that reminds me of some of the pumpkin beers on the market. T: Starts with some of the chai spiciness which is swallowed up by a bold full malt/wheat characteristic. Finishes with a fermented fruit sweetness. After taste in this is a little off-putting. M: Medium creamy body with ample mouthfeel. Sort of low on the carbonation. Easy drinking. Overall one of the more unique wheat beers I have tried. Glad to see Pyramid experimenting. Worth trying once. A: A somewhat hazy medium amber with a deep orange hue. The white head is quick to dissipate and made of rocky bubbles. S: Well balanced, moderate aroma of chia tea spices and an American Wheat Ale. The chia tea has cardamon, cinnamon and clove aromas while the underlying beer has citrus hops and a soft wheat aroma. There are light ginger and clove notes as well. T: Moderate wheat sweetness with a moderate to moderately-strong chia tea flavor with the ginger be the more predominate flavor. There are other spice flavor of cardamon and a light clove as wel. Low hop bitterness. The balance is about even the finish is medium and the aftertaste is of tea spices. M: Medium-light bodied with moderately strong carbonation. Just a slight prickle on the tip of the tongue. O: A a great example of a balance spiced beer where you can taste and smell both the spices and the base beer style; to often the spice just takes over but not here. It not a beer I'd go tracking down or highly recommend but it's good for it's style and the brewers intent. Poured from a bottle out of the sampler pack, the beer is a bright, slightly hazed, opaque, orange coloring with no head. Aromas of banana, cinnamon, green tea, and other herbs that I am not familiar with. Smells very warm and inviting. Flavors are very spicy, with cinnamon, green tea, black tea, and oregano on a roasty, bready, slightly sweet and fruity backbone. Aftertaste of the above mentioned spices, with some mustard and grassy character, too. Filmy, smooth finish with a slightly spiced linger. Very interesting. 12-oz. bottle into a pint glass at my house on Oct. 5, 2012 (purchased at BevMo in La Mesa (San Diego, Calif.) as part of a winter variety 12-pack for $15.99 (with card) on Oct. 5, 2012). Cloudy, straw with two fingers of bubbly khaki head. Average-to-below average retention on the top, good on the sides. Smelled a sharp whiff of peach right away, then warm tea. Also some orange, grass, wheat, butter and a bit of pear. Really liked it. Tasted pretty close to the nose with peach and warm tea leading the way once again. My wife tells me this tea is Chai, which makes sense I suppose. Also orange, butter, wheat grass and still that slight bit of pear. Light-to-medium body. Creamy texture. Above average carbonation. Long, astringent, buttery finish. I was pleasantly surprised with this beer. Tasted nice with the fruit/tea elements. A good change from the usual wheat beer. 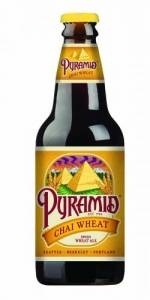 Chai Wheat from Pyramid Breweries, Inc.